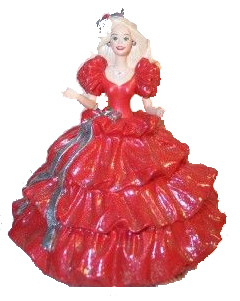 The 1988 Holiday Barbie Ornament was sold in 1996 as a Hallmark Collectors Club Exclusive Ornament. 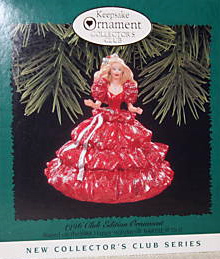 It is the ornament version of the 1988 Happy Holiday Barbie - the very first Holiday Barbie. At one time these ornaments were considered very rare and valuable, but now the secondary market prices are reasonable (sometimes even less than the original price) and while they are not the most plentiful Barbie ornament, they can easily be found.